﻿ Genesis 14:20 And blessed be God Most High, Who has delivered your enemies into your hand." He gave him a tenth of all. And blessed be God Most High, who has delivered thine enemies into thy hand. And [Abram] gave him a tenth of all. 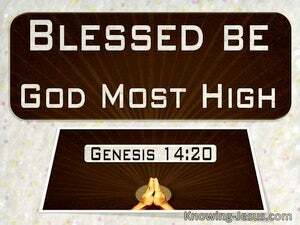 And blessed, praised, and glorified be God Most High, Who has given your foes into your hand! And [Abram] gave him a tenth of all [he had taken]. And praised be the most high God who delivered thine oppressors into thy hand; and he will give him of the tenth of all. 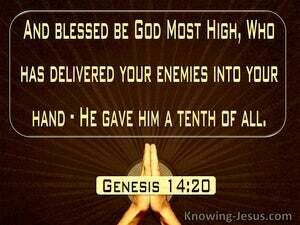 And blessed [be] God Most High who delivered your enemies into your hand." And he gave to him a tenth of everything. And blessed be God the most highest, which hath delivered thine enemies into thy hands." And Abram gave him tithes of all. 19 He blessed him and said, "Blessed be Abram of God Most High, Possessor of heaven and earth; 20 And blessed be God Most High, Who has delivered your enemies into your hand." He gave him a tenth of all. 21 The king of Sodom said to Abram, "Give the people to me and take the goods for yourself." "At the end of every third year you shall bring out all the tithe of your produce in that year, and shall deposit it in your town. All Judah then brought the tithe of the grain, wine and oil into the storehouses.